Hypoallergenic, completely synthetic, no plant or animal fibers to aggravate allergies. Upper surface holds the rug, preventing wrinkling and bunching. Specially stiffened lower surface grips the carpet, preventing creeping. Tough, consistent construction provides maximum cushion effect for minimum wear and longer rug life. 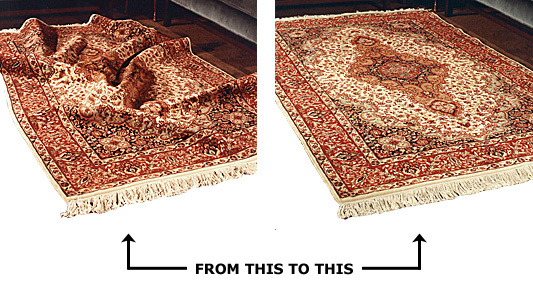 Specifically designed for use when Oriental or area rugs are used over carpet. Prevents ripping, bunching and moving, which makes your home safer from tripping. "Nothing else works like No-Muv™, because nothing else is made like No-Muv™!" Due to the changing nature of some vinyl floors, No-Muv Corporation advises to check with the flooring manufacture as some vinyls react negatively to rubber.